The recommended protocol for using BrainWare SAFARI is 3 to 5 times a week, 45 minutes per session, for at least 12 weeks. Most users will not complete all levels of the program within 12 weeks, but that frequency and intensity of usage are what have yielded consistently significant cognitive gains in our research. With any of the options, you still have the BrainWare SAFARI license after 12 weeks and can continue to use it as long as you wish. All of the options below work. It’s really a matter of preference. If you have the time and are usually able to keep to a schedule, that’s great and you can buy a BrainWare SAFARI license to use on your own. The BrainWare Assist or One-on-One Coaching options provide more more structure with built-in reporting and accontability. It’s a little like physical exercise; you can work out on your own or you can work with a coach. You have a variety of options when it comes to cognitive training. BrainWare SAFARI is the most researched, comprehensive, integrated online training program anywhere. It combines decades of multi-disciplinary clinical collaboration with an engaging video-game format. BrainWare SAFARI is the foundation of all of our cognitive training options. It can be used at home with a parent or other adult serving as the coach. You can purchase BrainWare SAFARI in our online SHOP. 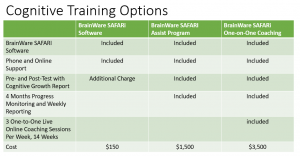 The BrainWare Safari Assist Plan provides you with an accountability system to keep you on track and pre- and post-testing using a scientifically valid nationally normed cognitive assessment so that you can see how much cognitive growth your child experiences over the course of the 12+ weeks of training. Our highly trained, experienced and friendly staff will review your progress and provide a report on a weekly basis of your child’s progress in BrainWare SAFARI. This includes an initial planning/training call and a wrap up call following the post-test, as well as phone support as you need it in between. Call 877-BRAIN-10 (877-272-4610) to purchase this option and schedule your training program. Every serious athlete has a personal trainer and you can have one for your cognitive training experience. 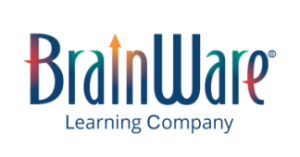 The BrainWare SAFARI One-on-One Coaching Plan includes three weekly online sessions with a Certified BrainWare Cognitive Coach. From wherever you are, you will get personal training and support throughout, as well as weekly reports and a final growth report giving you measurable evidence of your child’s progress (or yours, if you are the one doing the training).